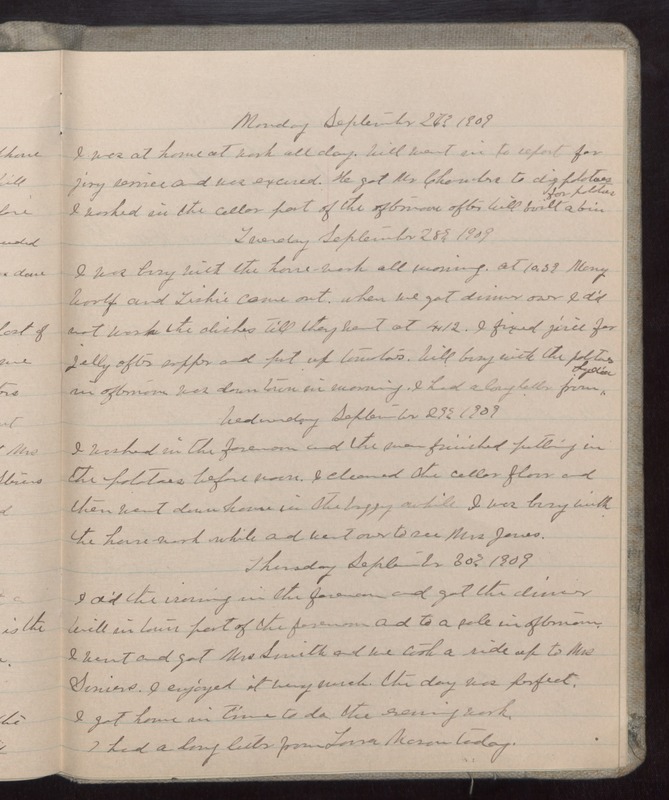 Monday September 27th 1909 I was at home at work all day. Will went in to report for jury service and was excused. He got Mr [Chamber?] to dig potatoes I worked in the cellar part of the afternoon after Will built a bin for potatoes Tuesday September 28th 1909 I was busy with the house-work all morning. At 10.39 Mary Woolf and [Lishie?] came out. when we got dinner over I did not wash the dishes till they went at 4.12. I fixed juice for jelly after supper and put up tomatoes. Will busy with the potatoes in afternoon was down town in morning. I had a long letter from Lydia. Wednesday September 29th 1909 I washed in the forenoon and the man finished putting in the potatoes before noon. I cleaned the cellar floor and then went down home in the buggy awhile I was busy with the house-work while and went over to see Mrs Jones. Thursday September 30th 1909 I did the ironing in the forenoon and got the dinner Will in town part of the forenoon and to a sale in afternoon. I went and got Mrs Smith and we took a ride up to Mrs [Suniers?]. I enjoyed it very much. the day was perfect. I got home in time to do the evening work. I had a long letter from Laura Mason today.